the tree is a dynamic live band, a trio that "brings it" as the saying goes. They play tightly arranged songs that blast-off into the improvosational stratosphere, as well as some tasty, mostly R & B/Soul covers. Having paid their dues, seen it all, and been there done that, the tree have a soulful stage presence. 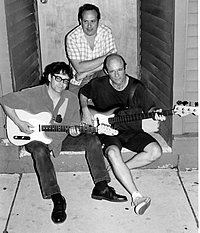 free steaming audio of the tree's new album, "Tip of the Iceberg"
AJ Robb, at the Halsted St. Market Days Festival, from the Chicago Sun-Times front page, July 4th 1989?